Honey, I got a speeding ticket. Well, 33 of them actually. In 3.5 hours. 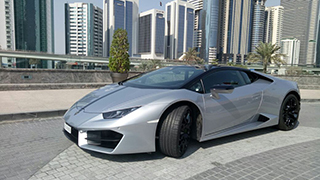 A visitor to Dubai from the UK racked up a $60,000 fine after driving at 240 km/h in a rented $355K Lamborghini. Cameras caught the 25-year-old breaking the speed limit 33 times between 2.30 am and 6 am just hours after renting the car. Some of the fines came just seconds apart as the driver raced through the city centre. The owner of the rental company is now holding the tourist’s passport to stop him fleeing the country. Because the business is the registered owner of the car, it is liable to pay the fines if the tourist refuses. Saeed Ali Rent a Car owner said the tourist had rented the car on 30JUL, paid two-day fees of over $2,000, leaving his passport as guarantee. The rental company owner said he was in no hurry to get the car back from the tourist because then he would have to surrender it to police and pay impound fees. A Lamborghini Huracan can hit speeds of up to 320 km/h, and can accelerate from 0 to 100 km/h in just 3.4 seconds. Why are they rented to tourists to drive on public roads? Who knows.